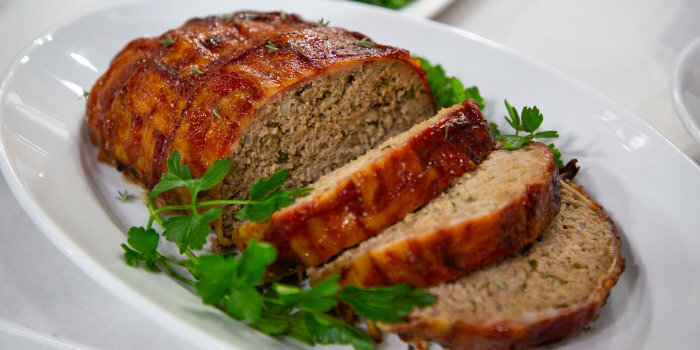 This is what most people think of as a true meatloaf. You can leave off the bacon if you don't want it, but it looks pretty impressive with it on (especially if you basket weave the bacon!) and it adds great flavor to the meat. Technique tip: Lay 4 pieces of bacon horizontally next to each other on a cutting board, weave 5 pieces of bacon through them, creating a basket weave. Invert cutting board, draping the bacon over the glazed loaf. Swap option: You can use panko or crushed crackers in lieu of traditional breadcrumbs. In a small bowl, combine ketchup and brown sugar. Set aside. 2. In a small bowl, combine eggs, yogurt, mustard, Worcestershire sauce, thyme, salt and pepper. Set mixture aside. 3. In a large bowl, combine meat, garlic, onion and parsley. Add egg mixture and mix to combine. Add breadcrumbs until the mixture no longer sticks to the bowl. 4. Turn mixture out onto a foil-lined baking sheet and shape into a loaf, approximately 9- by 5-inches. Brush loaf with half of the glaze. Top with bacon slices (you can also weave the bacon on a cutting board and invert on top of loaf) and tuck ends under loaf. Bake for approximately one hour until bacon is crisp and until the internal temperature of the loaf registers 150 degrees on an instant read thermometer. 5. Remove from oven and let cool for 15 minutes. Slice and serve with remaining glaze.